Sri Ganapati Tours & Holidays based in Tripura is a leading tourism service provider. Nagaland treasures some of the most prized possessions of natural beauty of Indian subcontinent. This offers an amazing tourism experience to the tourists that they cherish for life. The important cities of Nagaland include Kohima, Dimapur, Longleng, Kiphire among others. The Naga Hills offers the exquisite exhibit of some of the rarest blooms and fauna. 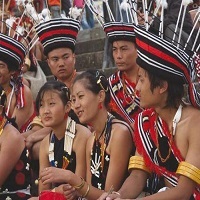 Nagaland is home to a large number of tribal groups that has a rich cultural heritage. Few of the important festivals of Nagaland include Festival of Chakhesang, Festivals of Angami and The Hornbill Festival among many others.